Clara Louise "Lou" Roberts was born on October 1st, 1936 to Karl M. Sattler and Clara E. Davis, Sattler in Newton, Kansas. She was preceded in death by her parents, sisters, Leona Allen and Marianna Hoffman, and brothers, Lester K. Sattler, Herbert R. Sattler, and Wilbur C. Sattler, a granddaughter Amy M. Hiebert, and husband, LeRoy Roberts. She is survived by her daughter Diana Myers and husband Calvin of Kalvesta, Kansas, and two sons Richard Roberts and wife Leeah of Fort Worth, Texas and David Roberts of Marion, Kansas, one sister in law, Irene Sattler of Newton, Kansas. She had eight grandchildren and nine great-grandchildren, all of whom she loved dearly. She married the love of her life, LeRoy Roberts on April 12, 1953, and they were married for almost 53 years. LeRoy entered into eternal life on August 27, 2005. She asked Jesus into her heart at the age of 9 in the EOB church in Newton. After Moving to Marion in 1960, she joined the Marion Christian Church where she was baptized as an adult. She was very active in her church, singing in the choir, teaching Sunday school, serving on various committees, and active in CWF. She had such a love for the Lord and Strived to serve him all of her days. She had very strong faith that brought her through the loss of her husband and many family members. She was a stay at home mom until all of her children were in school. In 1968 she went to work at St. Luke Hospital in Different Roles including, Accounts Receivable, and Accounts Payable, until her retirement in 2000, a total of 32 years. She loved music especially a lot of the old hymns. Singing and making melody in her heart to the Lord. She was in Sweet Adeline's for years. She was a member of the Neo-Century Club, Tops. She loved camping with her camping group, the Marionettes, and Newton Nomads. She loved working in the yard with her flowers, plants, and garden. She had a love foe birds, feeding and watching them. She loved to put together jig saw puzzles, she was addicted to them, once she got started. 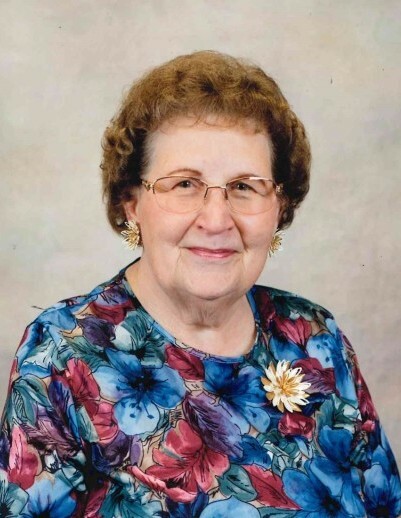 She went to be with her Lord and Savior, Jesus Christ on Tuesday, March 26, 2019.